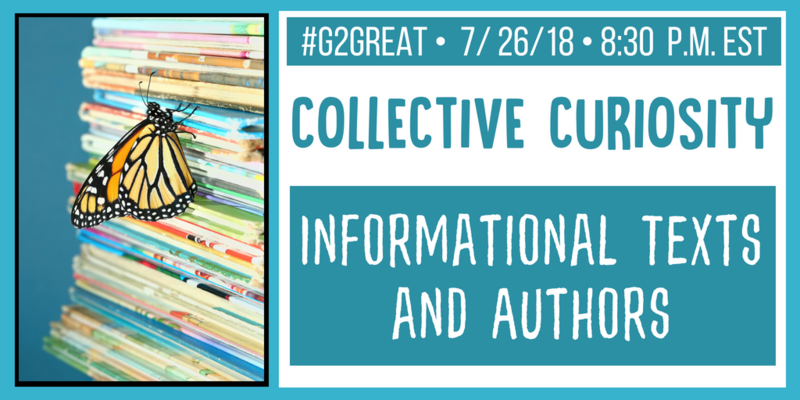 On July 26, 2018, our amazing #G2Great family gathered together to celebrate our Collective Curiosity for Informational Texts and Authors. Each week our chat trends on twitter and although we are humbled by this honor, we also know that it has little to do with me or co moderators Fran McVeigh, Jenn Hayhurst and Amy Brennan. Rather, we acknowledge that our trending status is the result of the enthusiastic circle of dedicated educators who hunger for engaging respectful collegial dialogue just as much as we do. I love the passionate twitter style discourse that swirls into the air at warp speed. But in addition to real time joyful dialogue, we are blessed to be able to take a trip down chat memory lane using two venues. First, thanks to our friends at Wakelet we can create “Wakes” to revisit the experience after the fact. Second, we each take turns writing an after-the-chat reflection where our unique perspectives breathe new life into the experience. 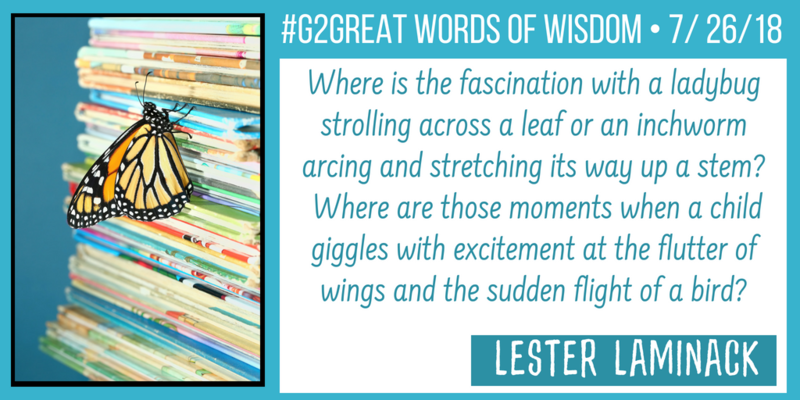 Lester’s words brought WHY into clear view and thus set the stage for the spirit of collective curiosity we had in mind when we crafted this chat. So I’m going to draw from Lester’s inspiration using three big questions to drive my thinking about informational texts: WHY? WHAT? HOW? 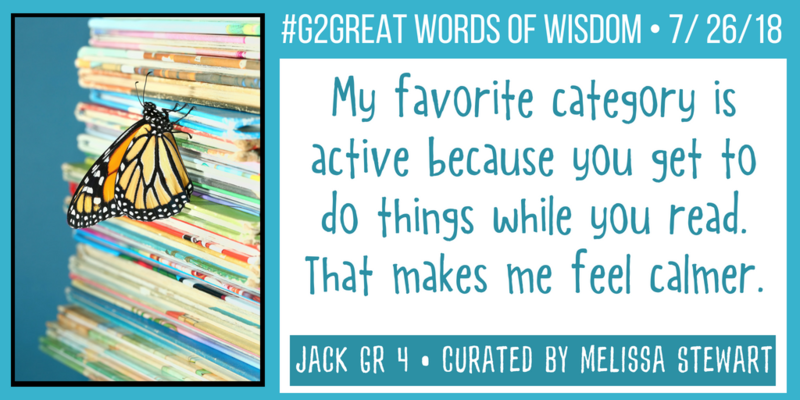 I’ll share my reflections around each one with a few #G2great tweets. These questions are the glue that always seems to hold my thinking together, so they seem custom made for this post on informational texts. Lester’s words set the trajectory for this post because his words reflect the heart and soul of the conversations inspired by our chat this week. Pause for a moment and reread his words as you envision the heartfelt meaning. Isn’t creating a sense of wonder, curiosity and pure unwavering joy what we want for all of our children? Our initial question asked our chat friends to send a love note to their favorite informational author. This question awakened a celebratory love fest for informational texts that lingered from the chat opening to the closing. The tweets below return us to the spirit of collective curiosity we believe informational texts deserve. We want those passionate “Oohs” and “Ahs” Jennifer describes to fill the learning air, knowing that this has much to do with our ability to create an joyful experience that will beckon kids to a shared informational love fest. Melinda eloquently refers to transporting children “in the middle of the ocean where hearts pound.” Informational texts can take us to places we can experience for the first time or one of many because informational text authors and illustrators/photographers intermingle powerful words and images in our honor. 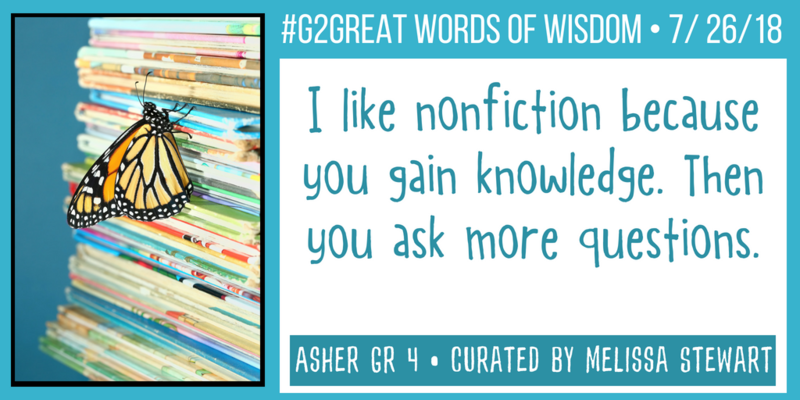 Lisa celebrates questions, wonderings, and passions that “come to life” when readers and writers unite in a passionate quest designed to heighten collaborative meaning-making. Valinda reminds us that when move beyond factual information we can uncover “a riveting narrative” patiently awaiting us. Go ahead and soak in that WHY for informational texts. We do not make informational texts a priority for the sake of completing Standards checklists, doling out passive worksheets, graphic organizers and tasks or playing the ever so dull hunt-and-peck fact game. 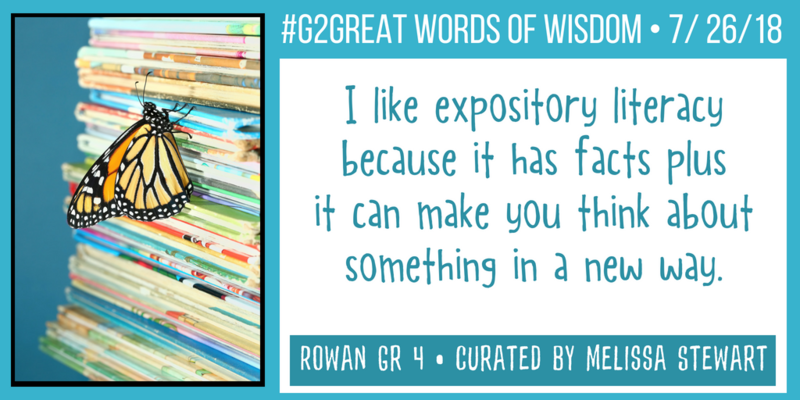 We share beautiful informational texts because we want to inspire the collective curiosity and wonder that is sure to elicit the oohs and ahhs that symbolize that spirit. When WHY is the GPS that allows us to set our sights on this process, then wondrous inspired and curious thinking is sure to follow. That seems like a worthy goal to have in mind before we even begin. WHY is the directional marker that gives us a sense of purpose, but in order to bring WHY for informational texts to life, we must first embrace the essential role only we can assume. Informational texts we thoughtfully and responsively choose for these experiences with children in mind may well reflect the ‘make or break’ that will captivate our readers or merely hold them unwilling hostages in a reader back seat. If we choose a boring, trivial text without considering the passions, interests and needs of the students in front of us, then we have lost our way along the path to WHY before we even begin get out of the starting gate. Responsible text choices with students at the center are only possible when we know our students – not as a number, score, level, or blip on a spreadsheet – but as learners who have incredible potential (and they all do). We must assume responsibility to take ample time to truly know students both as learners and humans, know text options are worthy of those students, and know the literacy process so that we can support and nurture our desire to bring kids and books together. None of these things can be left to chance or relegated to an outside decision-maker. I see this commitment to text choice in each of the four tweets below. Judy illustrates this point by cautioning the use of “sanitized texts,” opting instead for the authentic informational texts that would invite students to an intellectually and emotionally engaging experience. Laura reiterates this point by reminding us to choose the best possible informational books we can find and extends that message by highlighting opportunities to use the texts as a stepping stone to bring reading, writing and talking to the forefront. 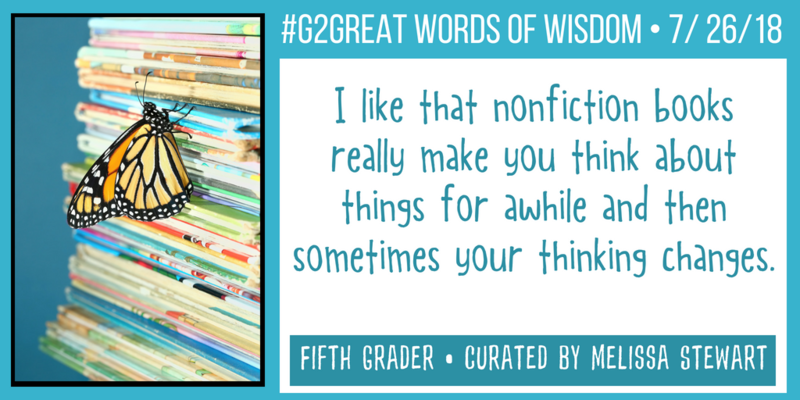 Melanie emphasizes the importance of broadening our view of texts by creating paired text sets displayed proudly in the classroom library and Mollie suggests that we create a place of honor to celebrate and spotlight informational texts. These are all ways to instill wonder and inquiry and it seems to me that this is the goal of every reading experience we bring into our teaching and learning spaces. WHY gives us a sense of direction, but WHAT allows us to pack our instructional bags to full with resources that will bring our purpose to life in action. As long as we continue to focus on informational texts in inflexible guided reading groups that reduce children a level from which there is no escape, we will never celebrate this role. We exacerbate this issue by choosing read aloud texts from controlled anthologies that have not only been ‘sanitized’ but basalized with cropped images and words that change the meaning along with wonder-curiosity potential. Without WHAT, nothing else will matter much so we must spend time contemplating the texts based on a wide variety of options that will excite, entice and invite our readers to the reading process. Once we have our directional marker of WHY (purpose) and our instructional bags are packed with the finest possible WHAT (texts), we then consider our HOW. HOW allows us to initiate instructional experiences that will enrich and elevate our purpose given the rich texts that we have lovingly gathered. Again, we cannot do this without knowledge of research and students. As we ponder our HOW around informational texts, we begin by contemplating how to create an experience removed from the mere “factual mining” that can easily become the default method when we don’t understand meaningful, purposeful and emotionally engaging experiences that lift those opportunities higher. Our purpose and texts inspire us to reflect on how we can design an experience that brings wonder and curiosity to the surface. Only then can we invite our children to joyfully learn their way across these opportunities that make reading writing and talking a seamless part of that process. Although HOW is too vast to reduce to a few tweets, the four I have chosen below do give us a starting point. We were so grateful that Melissa Stewart, informational picture book writer extraordinaire, lent her voice to our chat. I loved her words that these texts should initiate a self-driven research process through a ‘treasure hunt fueled by curiosity.” A treasure hunt is not a fact-finding mission but an opportunity for children to follow their passions with our support. Mary Anne reminded us that student choice is the tipping point to maximize the impact of these powerful opportunities. Whether that reflects choice in terms of WHAT OR HOW, we always leave room to put students in the driver’s seat so they can maneuver to a destination where magic happens. Melanie reminds us to seek out experts, using the gift of social; media, onsite visits or any means possible so we can give the text a face. Valerie’s “tiny notebook” ideas brought visions of our young researchers gathering personal passions in words, images or reflections of their choice. There are endless possibilities for informational text instructional implementation but each of these are rooted in professional decision making and student ownership. The essential HOW is not about finding a script that will blind us to these possibilities but to embrace our responsibility as knowledgeable decision-makers so that we can make the choices that no package ever could ever. We are well aware that no child was ever inspired as a learner by narrow preconceived question interrogation or packets that require little more thought than hitting a BUY button to passively download and print. As professional decision-makers, we recognize that we must trust the book to do the hard work and trust the child to apply our teaching and draw from their own inner resources so that we can then support rather than control this work. We willingly encourage children to follow their own curiosities through book clubs, passion projects, research groups or any other experience where we put decision making in their hands so that we can assume the ever so lofty role of facilitator and kidwatcher. As I was writing this post I realized that although I separated the three big questions of WHY WHAT and HOW, they really work in tandem. Like an enormous curiosity inspired puzzle, these three pieces of the puzzle bring us full circle from the beginning, the middle, the end and all points in between so that we make our way back to our children. It seems only fitting to share the wonderful student comments Melissa Stewart kindly curated as they reflected on their informational text choices. As I read each of these incredible reflections, I couldn’t help but wonder why we don’t take the time to ask our students about their preferences and use the knowledge in our own teaching. And so in closing I’d like to return to Lester’s beautiful words at the beginning of this post. As we reflect on creating an “experience” that will linger long after that informational text experience, I envision the same kind of fascination that will inspire moments filled with giggles of excitement Lester described, You see, our WHY WHAT AND HOW are so much more than mere questions. They represent our deep belief in our responsibility to create instructional experiences in the spirit in which those questions were intended – to celebrate those practices that will become a force of good so that we can enrich the learning lives of children. In the end, that is a professional imperative that only knowledgeable caring educators can bring to life! « What matters most? Reverence or Relevance? 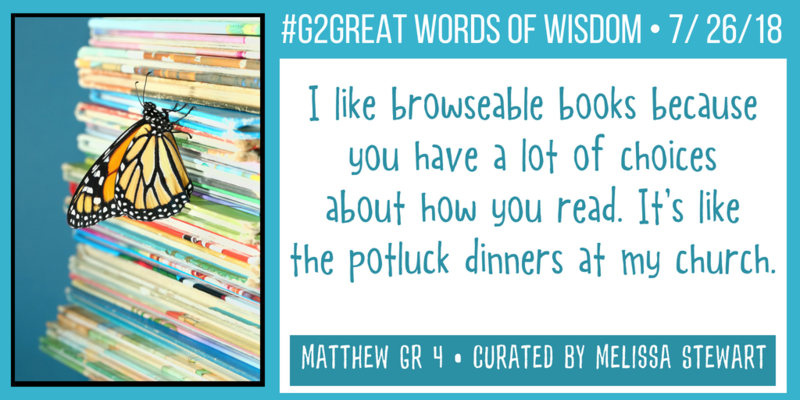 Mary – your thinking and sharing of the #G2great chat has me thinking deeply about how I display, book talk and share informational texts with my reading intervention students. Thank you for the nudge! Great recap of the chat as the What, Why and How are so critical to our own understanding. 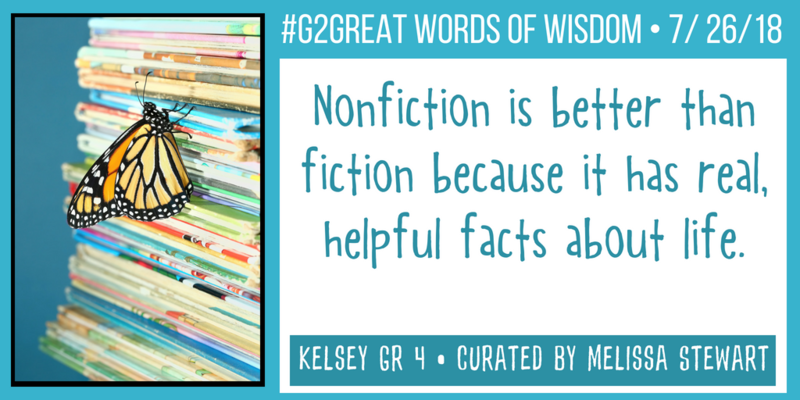 I also appreciate this work of Melissa Stewart’s on categories of nonfiction text … making us aware of the possibilities that exist as well as the need to open them all up for students!